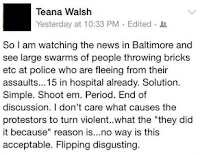 BHR Hollywood Reports........Wayne County (Detroit) former assistant prosecutor, Teana Walsh, posted to her Facebook page that the Baltimore protestors should be shot. “We are not an easily distracted people. Whether you agree with what the sister Ebony of East Point Georgia did by posting to her FB page to shoot all White cops is irrelevant, the fact is Teana Walsh is in the same boat and should receive the same treatment. Why should the sister get arrested, humiliated in front of the world and this White woman not suffer the same fate? They both did the same thing. 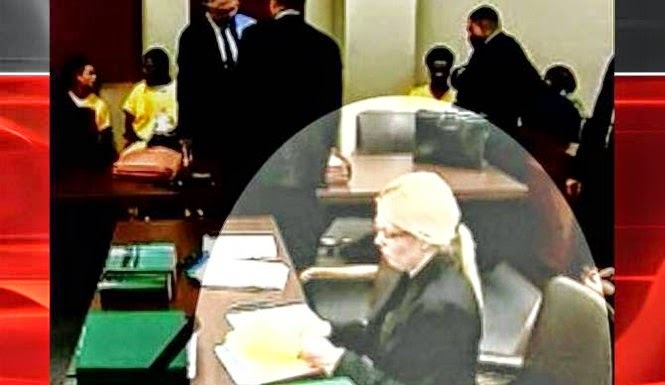 the White woman was an assistant prosecutor at the time she posted her comments to shoot the Baltimore protestors, no judge, no jury, just execute them, string them up, lynch them. Spread this petition far and wide calling for the arrest of Teana Walsh, resigning from her job is not enough,” offers poet and activist Rudwaan.